Vacation rental house. Sleeps 8, 2 bedrooms, 2 bathrooms. Dogs allowed. This clean, newly remodeled two bedroom 2 bath home is ready for your stay! 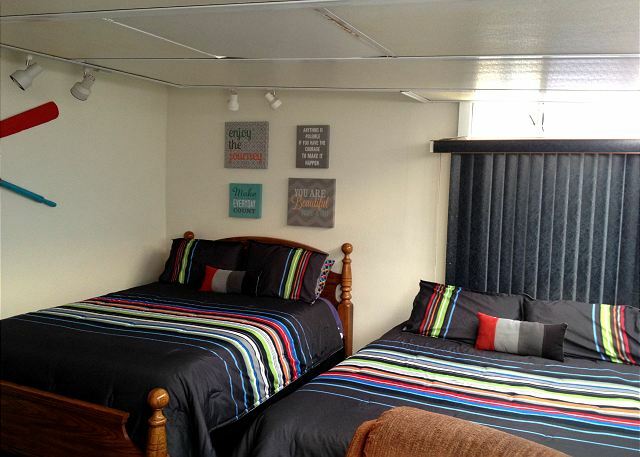 Large attached studio with 2 additional Queen Beds makes this the perfect getaway for a family with teens! Just one block from the beach access, easy 3 minute walk to the sand & surf. BBQ, W/D, dishwasher, WiFi & all linens included. The open floor plan is great for family activities . The newly remodeled kitchen has granite countertops, and all new stainless steel appliances. It is fully equipped with everything you need to prepare a gourmet meal. The dining table seats 4 comfortably, or 6 slightly cozy. Living area has a flat screen TV with DirectTv. The attached studio has 2 queen beds, flat screen TV, dvd player & xbox! There is a queen bed in the “master” bedroom and a double in the 2nd bedroom. a guest from Midway, Utah does not recommend this vacation rental. No granite counters in kitchen. Recently remodeled is a relative term. Studio room leaked when it rained. Carpet in studio had hole in it. House didn’t have smoke or CO2 detectors When I inquired. Needs a deep cleaning and pillows need to be replaced. Blinds in studio were non functional. Propanagers took care of issues when they arose. Rental was fine and good location- coffee pot was old and not working. Need to get a Keurig! No place to hang clothes in the studio! No dishwashing soap! We had a wonderful stay in this Bali property. Great location for walking trails and beach access. Our grand kids loved the attached studio. Kitchen is nicely updated, comfy beds. Neighborhood is quiet. We had issues with electronics and Marissa was over at the house within 20 minutes to offer us support. Wonderful Customer Service.We hope to return next year! Renting for 4 months. House is great & I hear the ocean at night. Wish I could buy this place. Amazing house! Great location! Great for the kids! We had an amazing experience in Morro Bay. The house was very clean and has obviously been newly remodeled. Everything was brand new and shiny! We loved the large front room with the giant TV and room for our whole family to sit. The kitchen has all new appliances. We cooked all weekend! One of the best parts was the studio. Our kids took over the studio and had a great time watching TV and playing video games without bugging the adults in the front of the house! It was amazing! And the beach... it is super close. The beach is huge and open. We watched the sunset every night! We will be back! Best weekend ever!! we rented this nice home on Martin Luther king weekend, This home is clean and spacious that can accommodate a large family, The location is walking distance to the beach. Looking forward to my next stay.